Update: The source of this photo is the Cincinnati Historical Society Library website. 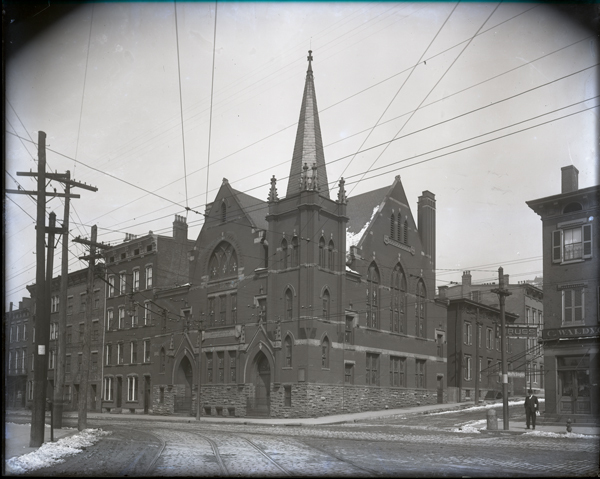 The photo title is “Third German Methodist Episcopal Church, Northwest Corner of Lang Street and McMicken Avenue” and the photo date is 03/16/1916. It’s sad that this beautiful church was lost, but there is still something to learn from the pic. Look how much better the building across the street on the corner (far right in the old photo) looks then as opposed to now. Wouldn’t take much to bring it back to its former glory. I attended the church that now stands there from birth until it closed in 2002. While it is not architecturally important its congregation has served the community well first by moving there from its own historical building (please read about the great Wesley Chapel that stood on 5th St. from 1831 until P&G built its new HQ) to serve a forgotten community in OTR. This included rehabilitation of surrounding buildings and the start of an important mission center (WCMC) which continues to serve children in the community in many ways and occupies adjacent buildings. Unbelievable. Do you know when it was taken? I wish I could remember the source of this photo. I found it months ago on a library or historical society website. I would guess around 1910. Pictures like me always depress me. So many great buildings destroyed. Does anyone know why the original church was demolished? It appears all the surrounding buildings are still there. I am a fan of this series and I think you may have an all-time champion with this one.